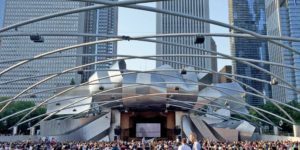 Join us on an audio tour of Millennium Park produced by Past Preservers. 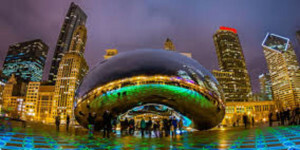 A blighted area revitalized into a prime urban space, Millennium Park was groomed from the iconic Grant Park near the Lake Michigan shoreline. The park the Jay Pritzker Pavilion, a futuristic bandshell designed by Frank Gehry. The Great Lawn in front of the pavilion features a sophisticated sound system that seeks to replicate concert hall acoustics. Another iconic fixture is the Cloud Gate sculpture, known as “The Bean” to Chicagoans. This is a three-story glistening steel structure, designed by Anish Kapoor. Inspired by liquid mercury, and being highly reflective of the downtown cityscape in front of AT&T Plaza. Also visit the Crown Fountain designed by Jaume Plensa and constructed by Kreuck + Sexton Architects. The installation features a striking black granite reflecting pool between two monolithic glass towers with an interactive digital display of Chicago residents seemingly spouting water from their mouths.